The truth about this top is, I sewed in one sitting, which ended at 5:30am and was fueled by British crime procedural TV shows (Broadchurch is kinda boring but kept me going). I think I started cutting the pattern around 9pm, so really it wasn’t that time cosuming, lol. The ruffles are sandwiched between the yoke and yoke lining. This pattern has lots of markings to help you get crisp points to the yoke corners. I made French seams for the ruffle corner seams. This is clean, but caused too much bulk at the corners of the yoke, so I don’t recommend it. I added fullness to the body of the blouse, and if I make this again, I will add a couple more inches. The finishing of the back slit is nicely done. I made a hand crocheted loop for the button. 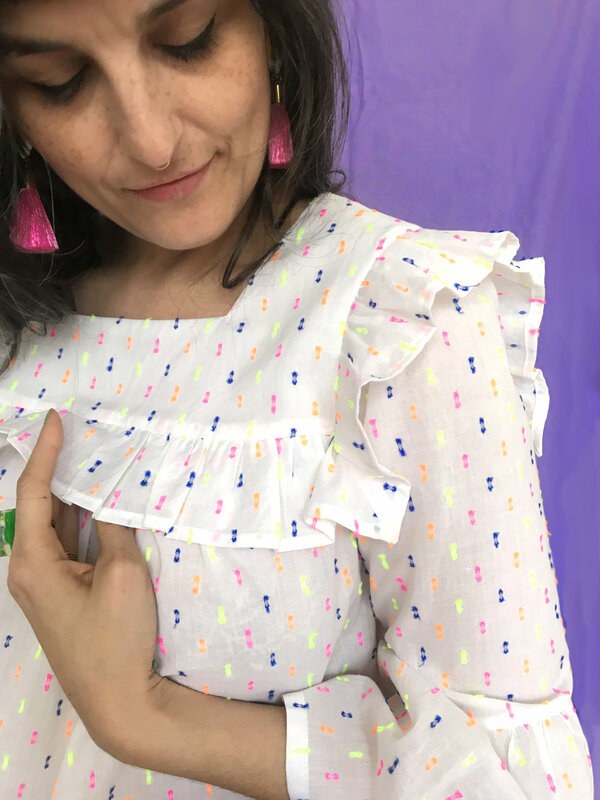 What makes this piece special is the fabric: Those clipped dots are NEON, and the base fabric is a light, slightly sheer cotton voile. This fabric really is as incredible as you might be imagining. The bad news is, I bought it on eBay and I think it was a one of a kind find - it shipped directly from India. I used most of my 3 yard cut, 44” wide. I am always hunting for Swiss dot fabric, and sometimes it leads me to technicolor greatness. I think this pattern would also be beautiful in a slightly sheer silk, or a drapey fabric with a touch of metallic. There is no instruction regarding mitering the corners of the ruffle. Yoke instructions are ok if you’ve made a blouse with a yoke before. Overall, the instructions seem fine to me, but presume a level of knowledge; this pattern is probably best suited for intermediate on up. • Removed 1” from CF yoke width. Holding it up to my body before cutting, I contemplated cutting this piece at size 6 because it’s so wide, but removing an inch is more drastic than the 6, so I went with removing 1”. • Added 2” CF bodice width. Pattern claims to be “very loose” but I’d say it’s “semi-fitted”. I wanted fullness, and even adding 2” and using minimal seam allowance was not enough to give satisfactory style ease. The back pieces do not “gather” into the yoke, they basically ease in. If I hadn’t added width, there almost isn't enough ease to get this on. • Speaking of ease, the upper sleeve is skin tight. Possibly negative ease. For me, this was unwearable as drafted! I slashed & spread to get what I want, and then had to patch together scraps to re-cut (seams hidden in armpit). I added about 1.25” width. • Shortened sleeve ruffle 3”. 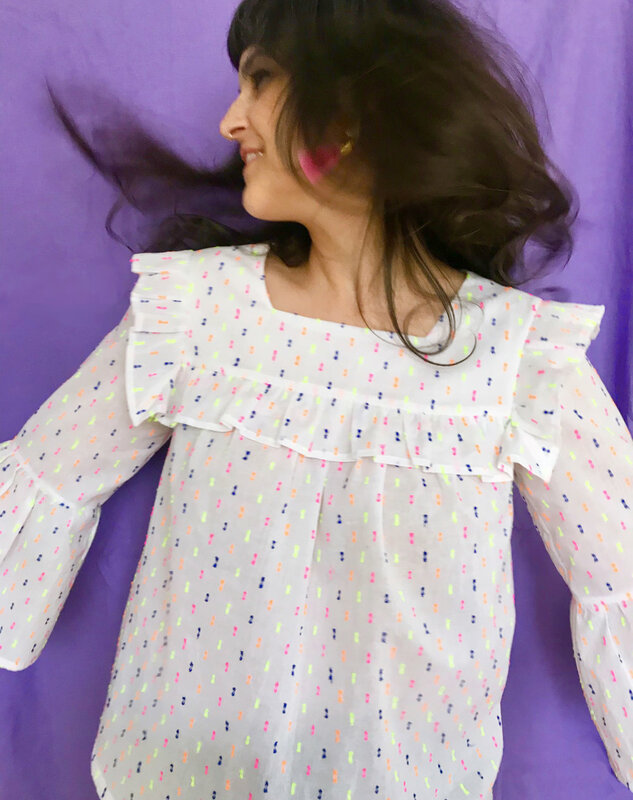 Now that I have made the necessary alterations, I would consider making this pattern again, because I love that the ruffles go all the way around the yoke. 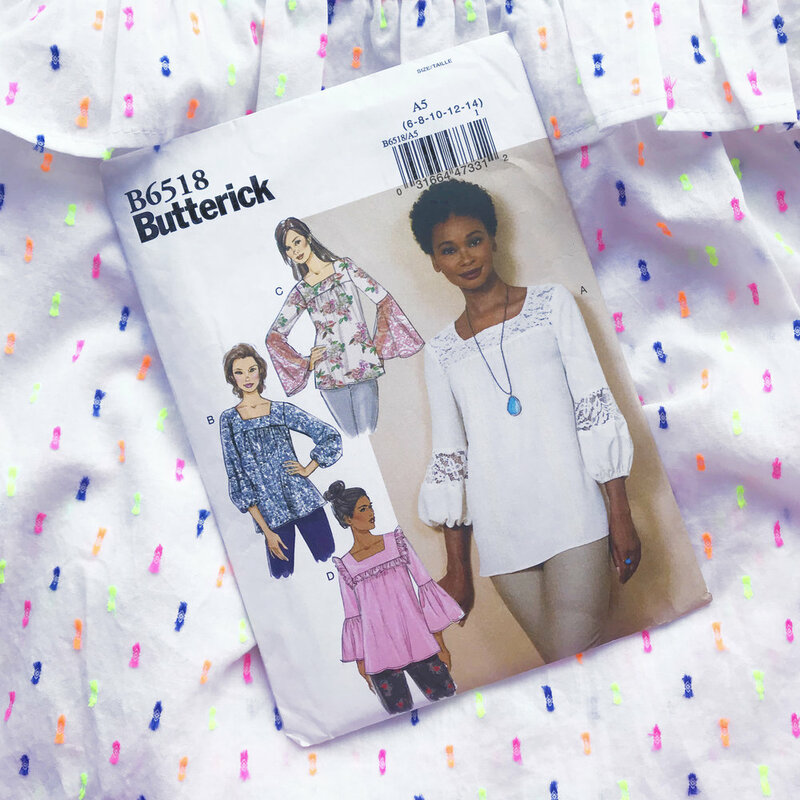 You can make a nice blouse, but it needs to be adjusted beyond the usual fitting tweaks, and as drafted, it is not “very loose fitting” like the envelope says. I recommend making a muslin.